This course is only offered to new international students. Local students in an existing UTS course may be able to transfer into it. Successful completion of the UTS Insearch Diploma of Information Technology with no more than two subject failures guarantees admission to the Bachelor of Science in Information Technology with up to 48 credit points of recognition of prior learning. 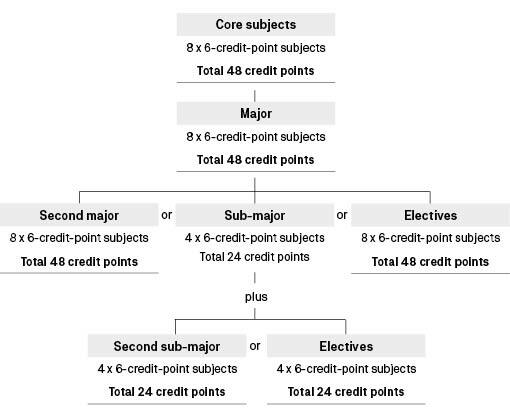 Students admitted through the UTS Insearch pathway are eligible for 48 credit points of recognition of prior learning. Students who have completed a relevant diploma at TAFE NSW may be eligible for at least 24 credit points of recognition of prior learning. There are also articulations with this course with institutions in China, Hong Kong, Malaysia and Singapore. Details are available from the Building 10 Student Centre. The Bachelor of Science in Information Technology may be awarded with distinction, credit or pass.